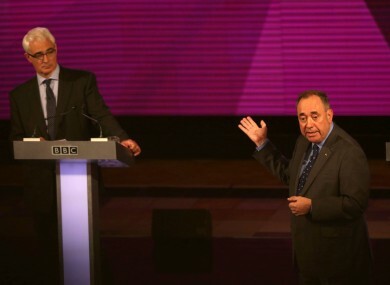 Scottish First Minister Alex Salmond (R), makes a point at the expense of No Campaign leader Alistair Darling. SCOTLAND’S FIRST MINISTER and Yes campaign leader Alex Salmond won a decisive victory last night in a tempestuous debate against No campaign leader Alistair Darling. With just three weeks to go until the referendum, the pro-independence Yes campaign needed a major boost, with polls showing the pro-union (Better Together) side leading by 51 to 38%. A Guardian/ICM snap poll taken immediately after last night’s debate in Glasgow showed 71% of viewers believed Salmond had won the debate, no doubt offering a glimmer of hope for Scottish nationalists ahead of the 18 September referendum. In a 90-minute encounter broadcast live on TV throughout the UK, the two campaign leaders clashed over questions of currency, oil, the NHS and jobs at the Trident nuclear missile base. At times the debate descended into something of a shouting match, and the two men threw pointed barbs at each other, most notably when Salmond accused Darling (a Labour MP and former UK Chancellor) of siding with the Conservative government of PM David Cameron. Why are you standing here defending Conservative policies on a joint platform with the Conservatives? The Better Together campaign, which Darling heads, is a cross-party group including the Labour party, Conservatives and Liberal Democrats. Darling, for his part, drew loud applause from the audience when he attacked the First Minister for lacking a “Plan B” when it came to the question of which currency Scotland would use in the aftermath of a Yes vote. I had no luck [in the last debate] when I kept asking him what Plan B is – he either can’t say, or he doesn’t think we’re going to like the answer. Watch the debate in full below. Email “Scottish nationalists win big in feisty debate - weeks before independence vote”. Feedback on “Scottish nationalists win big in feisty debate - weeks before independence vote”.